The BERTSOLARI is the artist in Basque society who is capable of improvising Basque poetry on any subject spontaneously and setting it to music. Such a vocal composition is called a bertso, the person who sings it is called a bertsolari and the art of composing bertsos is called bertsolaritza. Excerpt from Joxe Mallea-Olaetxe's Shooting From the Lip: Improvised Basque-Verse Singing. 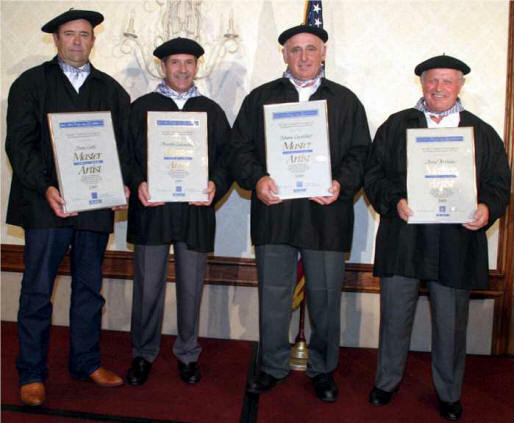 Traditionally, the bertsolari has been regarded as the most Basque among the Basques for his/her art is inextricably linked to the language, and it has never been any other way. When it comes to the language, the bertsolari is the ultimate authority. 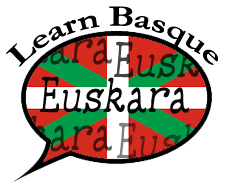 He/she may not have a university degree, but there is no grammarian, linguist, or writer who know the intricacies of the Basque language like him/her. More precisely, the bertsolari knows the Basque soul better than anyone else and can reach the Basque mind with a straight shot. In the past the bertsolari figure was intimately tied to the Basque peasant people, the baserritarrak (the backcountry villagers) or laboriak, the farmers. [Whereas today its stronghold is in the urban areas.] If Basques lacked the written variety of literature, not so the oral, which is comparable to any other in Europe in quality and quantity. A bertso is the exact opposite of the painstakingly though-out and rehearsed thirty-second media ads we watch everyday on TV. It is also quite unlike poetry written on a piece of paper. Like life itself, they are a "one-try" art with no second chance. Because improvising poets must do their work in a hurry, they cannot be bothered by all the grammar rules, which are often broken. Bertsolariak know when to break or bend grammar rules, and when not to. However, even they must abide by some basic rules by which the art is judged. For example, a) they must adhere to rhythm, b) the poetry must rhyme--usually the even lines--and c) this must be done in song. The predicament of bertsolariak is not enviable. First, they must stand in front ofan eager public, who at the same time is also their judge. One thing they cannot afford is to be nervous or uptight. Their greatest asset, therefore, consists in being plaza gizona (a man who is comfortable in public). No one knows when the bertsolari art originated. In the old days, it was thought that one is born a bertsolari. You cannot learn this trade, they said. But in the last decades that theory has been disproved; women, young people, and even children in Euskal Herria improvise poetry now. World bertso champion Maialen Lujanbio, the first woman winner (2009).This national level event comes around every four years. Behind her at left is Andoni Egana, the former four-time winner. There are scores of possible tunes which can be used for singing a bertso, stemming from traditional songs that once caught on and embedded themselves in folk culture. They are all, however, unaccompanied. To listen to some of these tunes visit: bertsolari.net. Hasierako Agurra "The Initial Greeting": the bertsolari has to address the audience at the start of the day's competition, usually with a free choice of metre and topic. Gartzelako Lana "Prison Cell Task": the bertsolari has to compose and sing a bertso to a given topic. 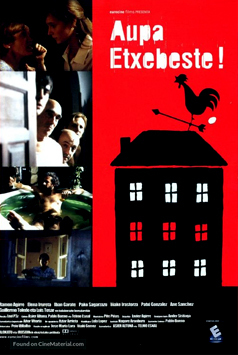 Elkarrizketa "Conversation": two bertsolaris have to deal with the topic together, singing the stanzas in turns and responding to the previous statement. Again the topic is given. Puntua Jarrita "Point Given": the jartzaile sings a puntu and the bertsolari has to complete it, staying within the given tune and metre. Hitza Emanda "Word Given": the jartzaile gives a key word to the bertsolari who has to compose a bertso containing this word. Oinak Emanda "Rhymes Given": the bertsolari is given the four (or more, depending on the metre required) rhyming words and is required to compose the bertso "around" these rhyming words. Txapeldunaren Agurra "The Winner's Farewell": here the bertsolari is allowed to compose their farewell to the audience.